SIG SAUER, Inc. is proud to announce the selection of the striker-fired P320 as the sidearm of choice for the North Dakota Highway Patrol (NDHP). The NDHP was organized in 1935 with just five patrolmen. Their duty was to enforce state laws pertaining to the protection and use of highways in North Dakota, the 19th largest state with the highest number of roads per capita. Today, the NDHP boasts over 150 sworn officers who are assigned a wide array of tasks, ranging from driver examinations to protecting the northern border. Before selecting the SIG P320 in 9mm, the NDHP utilized P226 pistols chambered in .357 SIG. Since its introduction in January 2014, the revolutionary P320 has gained tremendous momentum in the firearm world. 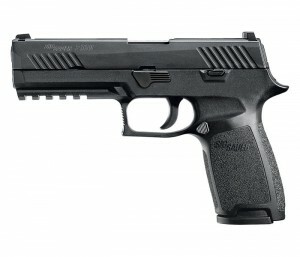 Earlier this year, the U.S. Army selected a variant of the P320 as its next service pistol. With unprecedented modularity and a clean, crisp trigger pull, the P320 sets a new standard for striker-fired performance. The serialized trigger group is interchangeable, allowing the shooter to transform the size and caliber of the pistol. Full size, Carry, Compact and Subcompact frames are available. Grip frames are further divided into small, medium and large to accommodate any hand size.